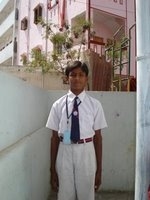 I am K SHYAM SUNDER studying in class X at Swathi High School. My father is a House Keeper and Mother is a House Wife. They strive day and night so that I don’t sleep hungry. I want to be a Software engineer and help my parents so that they have a better life when they are old. I want to develop software which will make the lives of poor and illiterate easy. I know this would be very difficult for me in the present state. Life has been very challenging, every day has been a struggle for us, but I have taken a pledge to provide every possible happiness to my parents through my hard work. I becoming an engineer would fulfill that, I have a belief that if one has will, then anything could be possible. Please help me in making my dream come true. Ambition I want to become a Software Engineer and give my parents all happiness of the world” I want to earn lot of money to support my poor family.